A new partnership between Tidewater Community College and the Virginia Ship Repair Association (VSRA) offers marine welding training for students seeking employment in one of the hottest fields around. TCC will graduate its first class as part of the VSRA Pre-Hire Marine Skills Training Program on Feb. 1. The VSRA program is designed to help meet the workforce needs of regional shipbuilding and ship repair companies by providing training in marine electrical, marine coating and marine welding. 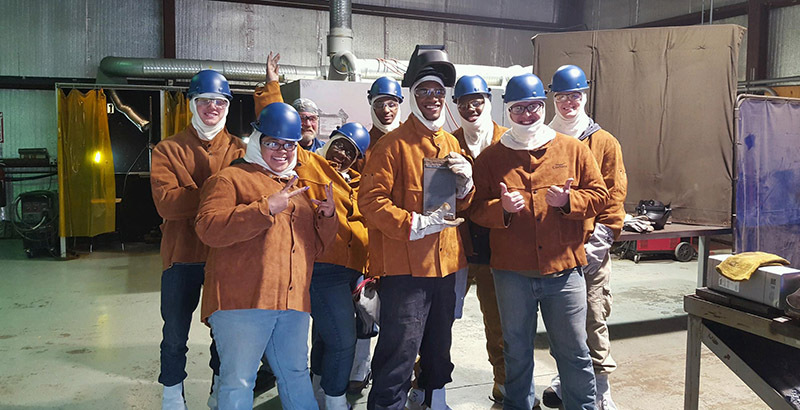 After successful completion of the three-week welding course, all students will be offered immediate employment by Newport News Shipbuilding, a division of Huntington Ingalls Industries. All VSRA member companies can participate in this new program as their workforce needs arise. A second group of students will begin on Feb. 6, with tuition assistance from the General Assembly-funded Workforce Credential Grant program. Classes are held at the facility TCC leases from NSC Technologies on Mount Vernon Avenue in the Port Norfolk section of Portsmouth. The aging workforce in this lucrative field and the employment opportunities in Hampton Roads, which relies heavily on shipbuilding, ship repair and manufacturing to fuel its economy, make welding an attractive career option. “The VSRA Pre-Hire Marine Skills Training Program represents a true collaboration between one of our region’s preeminent trade associations and our outstanding local community colleges,” said Todd Estes, TCC’s interim associate vice president for business and corporate solutions at the Center for Workforce Solutions. Applicants must be at least 18 years old with a high school diploma or GED. They must have a valid driver’s license, be United States citizens and qualify for security access. Initially, applicants must complete the Virginia Career Readiness Certificate. “The Virginia Ship Repair Association and our local community colleges take enormous pride in our invaluable partnership,” said Bill Crow, president of VSRA. The program is offered based on VSRA-member employer needs. For information, contact Estes at 757-822-1784 or mestes@tcc.edu. Applications can be completed at www.shiprepairtraining.com.